As the ASEAN Community commemorates the 51st anniversary of ASEAN last week on 8 August 2018, the region has experienced simultaneous multiple disasters in the past few weeks, including extensive flooding in the northern ASEAN region and powerful earthquake in Lombok, Indonesia. Earthquakes and aftershocks had occurred in the tourist island of Lombok since late July 2018, with the biggest 7M recorded on Sunday, 5 August 2018. Almost 400 people have been reported dead, with more than 350,000 people have been displaced, while the economic loss is estimated reaching USD 138 million. The ASEAN Coordinating Centre for Humanitarian Assistance on disaster management (AHA Centre) has been supporting the Government-led emergency response operations, especially in managing and disseminating information, deploying ASEAN Emergency Response and Assessment Team (ERAT), as well as delivering non-food relief items, including family tents, a portable multi-storage unit, personal hygiene kits, and family kits. The AHA Centre facilitated the mobilisation of ASEAN relief items from the Disaster Emergency Logistic System for ASEAN (DELSA) regional stockpile in Subang to Kuala Lumpur International Airport, whereby the Indonesian National Disaster Management Authority or BNPB chartered aircrafts to pick up the 30 tonnes of ASEAN relief items in two sorties and send them over to Lombok, for further distribution to affected communities. The AHA Centre has been monitoring the regional seismic activities on a regular basis. Information exchange between the AHA Centre’s Emergency Operations Centre (EOC) and BNPB has been intensified since over 500 earthquakes have been recorded in Lombok between 29 July 2018 to date. 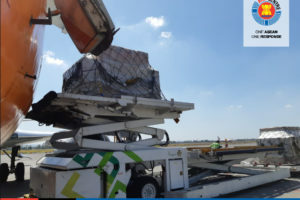 The extent of the damage creates urgent needs for shelters in the affected areas, thus BNPB and the AHA Centre mobilised the stand-by relief items from the ASEAN emergency stockpile in Malaysia, using Indonesian aircrafts. Ten ASEAN Member States have established the AHA Centre as the primary regional disaster management coordinating agency in ASEAN. Indonesia has been actively involved in the establishment of the Centre, and has been the host since the Centre was established in November 2011. The AHA Centre is entrusted to manage some regional mechanisms, such as the standby assets in Subang, so that they can be utilised when needed by the ASEAN countries. The ASEAN Declaration on One ASEAN One Response: ASEAN Responding to Disasters as One in the Region and Outside the Region was signed in Vientiane, Lao PDR in September 2016 by all Heads of State/Government of ASEAN Member States, including the President of Indonesia, Mr. Joko Widodo. The Declaration re-emphasizes the role of the AHA Centre as the primary ASEAN regional coordinating agency on disaster management and emergency response that can render ASEAN’s support collectively when a medium or large-scale disaster happens in the region. 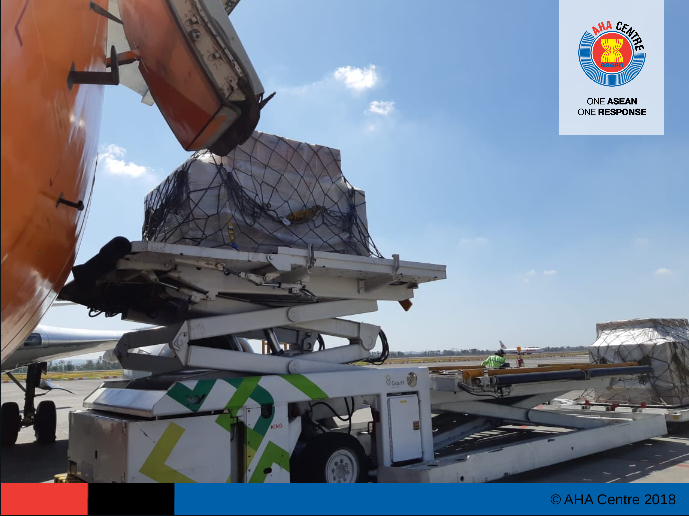 Apart from mobilising the ASEAN relief items, the AHA Centre also dispatched its in-country liaison team since 6 August, and the ASEAN-ERAT since 8 August. 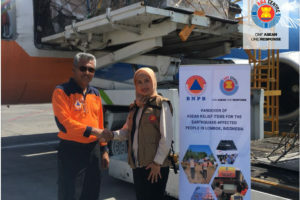 The ASEAN-ERAT, composed of trained individuals from Malaysia, Singapore and the AHA Centre, have been conducting joint assessments with BNPB and the local agencies, to gain direct exposure to Indonesia’s ongoing emergency response. The AHA Centre also supports BNPB’s Data and Information Centre in reporting, information management, and dissemination. The ongoing mission in Lombok is the Centre’s fifth response this year. Since its establishment in November 2011, the AHA Centre has responded to 23 emergencies in 7 ASEAN countries. BNPB hosts the AHA Centre on the 13th floor of BNPB building in East Jakarta, Indonesia. coordination amongst ASEAN Member States and with relevant United Nations and international organisations in promoting regional collaboration in disaster management. The AHA Centre is based in Jakarta, Indonesia. 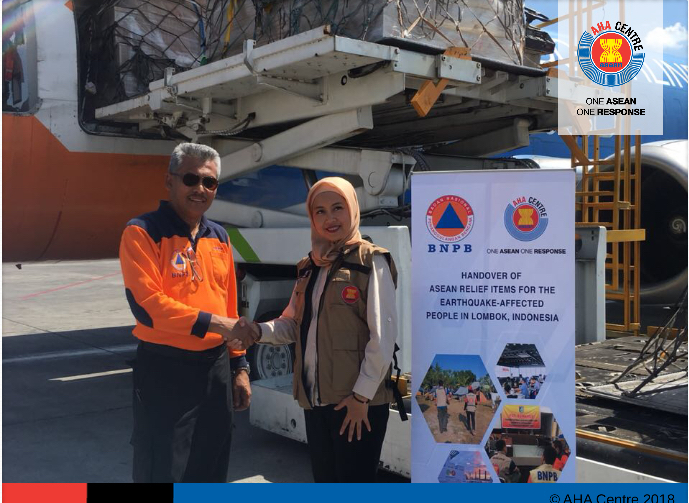 Through the support of the Japan-ASEAN Integration Fund, the AHA Centre is managing the Disaster Emergency Logistics System for ASEAN or DELSA to enable rapid mobilisation of ASEAN relief items from within and for the ASEAN Member States.